I have yet to get an email from TCM with the "Now Playing" guide....I have subscribed a lot of times, with different emails, with different browsers. NOTHING. I have contacted TCM with my problem. NOTHING. Really frustrating. Just for giggles, I put my email on the list two days ago. Nothing in my Inbox or Spam. Trying to contact a human at TCM doesn't seem to work at all. Got mine yesterday. Did a quick scan of topics and deleted it. Too much trouble to open all the items to find out not interested in them. I've tried every suggestion posted and I still have yet to receive this thing in my email. Is there anybody out there that can post the newsletter on a monthly basis? TCM really failed us by dumping the Now Playing Guide in the mail. I dropped the newsletter by email. I did ad it back to my AOL account, and it didn't come. I added my account only a day or two before the beginning of May. TCM needs to bring back the guide in the mail. Many of us will pay more, plus TCM could put ads for all their extra stuff inside. I suggest the guide to our mailbox could be for two months at a time. Any movie substitution could be posted online and on-air. So, Janet, TCM could post the current email guide on the website, but they don't. They only post "Archive of Past Issues." I refuse to print the "Month Schedule," or even the "Full TCM Schedule" for the week. I use TCM's website on my computer or tablet. I use Windows 10 and the Google Chrome browser. Between the two, it is easy enough to print to a PDF. Most, if not all, tablets and smart phones can open and view a PDF. That is all I can suggest for now, is printing to PDF the "Month Schedule," and sending it to a tablet or phone. TCM is just LAZY. They don't even confirm you being added to the email list. I don't believe dropping the printed guide is TCM being CHEAP. NO! LAZY! I'd like to know why some members are getting this in their email while others are not. And why doesn't TCM post it somewhere? I do print out the monthly schedule because I like to have it in hand. We use to subscribe to the TCM guide in the mail. In the beginning, it took 2 to 3 months for the first issue to arrive. Same thing when you renew. You had to pay well in advance or skip an issue or two. I originally signed up for the email version as soon as possible. Did not get the first issue. Did get the mid-month issue, but for a few months it was sent to my junk folder. I dropped it a while back, as my new tablet was handy. But when people such as you said it didn't work, I added my name back to the list. I will post here if the 5/15 email arrives. I refuse to print the guide. I had to read the Now Playing Guide with a magnifying glass, but loved (LOVED) reading about the next month movies a little bit in advance. In a heartbeat, my household would pay $19.99 for SIX issues/year of the Now Playing Guide in the mail. Anyone else? Are you listening TCM?? EDIT: Did not receive the 5/15 email. Top, what do yu think of this newest-latest online version vs NP Guide Magazine though? Top, what do you think of this newest-latest online version vs NP Guide Magazine though? I like it. I prefer it online. I signed up for, and now receive, the Roku Newsletter. That same email address still gets nothing from TCM. I find it just as easy to use the guide here on the TCM site. On the other hand, once you get into the schedule for the full month, you can't get out. Also, the HOME page link is at the bottom of the screen. I SIGNED-UP FOR THE FREE TCM DIGITAL NEWSLETTER, BUT HAVE GOTTEN NOTHING YET??? Top, as I just wrote I signed up a couple days ago, but have gotten nada about it Any suggestions? How's that saying go? Can't get blood from a turnip? I have tried two email addresses. 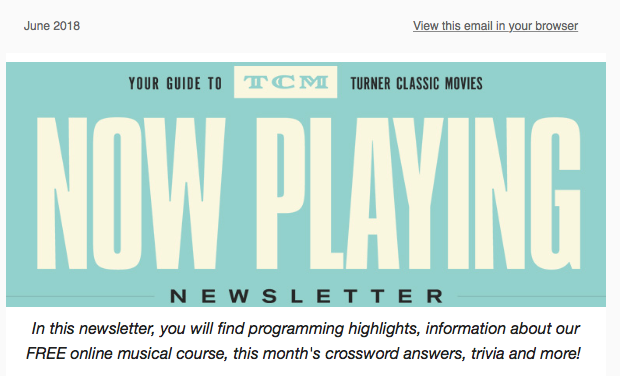 TCM needs a more reliable way to email the newsletter. Still don't know why it has to be email and not just a link on their website. You probably need to wait a few weeks. Some of us already received the June issue from TCM. So you'll probably have to wait until the July issue gets sent out. Patience. Hello pal, whats it like, similar to that superb "NP" magazine? I literally saved all of those & they can & do fill a lg hefty bag! I ran out of patience with TCM already. The way the printed guide was handled was terrible. First issue received took three months as did any renewals. This could be the weakest link in the TCM chain. Which one do you mean? The old & superb "NP Guide" magazine or this new digital version? I don't think one version of the NP Guide is better than the other. Times change and TCM is going digital. I'm okay with that, except I refuse to use my printer and ink to print what use to arrive in my mailbox. The email guide is useless if it doesn't come. I am monitoring the FilmStruck thread, and their website. Programming looks fine. Don't need a guide, do I. Perhaps the new email guide is not compatible with some email providers. If so, TCM should say so. I have not used my primary email for the TCM email guide, as I know what happens when spam takes over. I signed up for a Roku newsletter, and it works fine on my AOL email. Got an original confirmation from Feedburner, a part of Google. Isn't just about everything a part of Google. I am tired of being patient with Turner Classic Movies! On 5/31/18, I put my email on the MailChimp list for The Film Detective. Today, 6/1/18, got my first message. NOTHING from TCM to 3 different email addresses. Happy July everyone. Nothing from TCM, AGAIN! I did get my monthly newsletter from The Film Detective! I've been complaining about this since I joined. That might be why I joined the forum, to complain about the newsletter that never comes to my email. I have requested the FilmStruck newsletter, and it hasn't come yet either. My AOL email receives everything else I request. At this point, no one even pays attention to this thread or the one in Message Board Announcements.